How do I upgrade Cashmanager Desktop to the latest version? From October 2017 we will not be able to generate new annual license keys for desktop versions that are older than 6.8. By ensuring that you're up-to-date with the latest release we can continue to license your database and, because your annual subscription fee includes access to version updates, there is no charge to upgrade to the latest release. 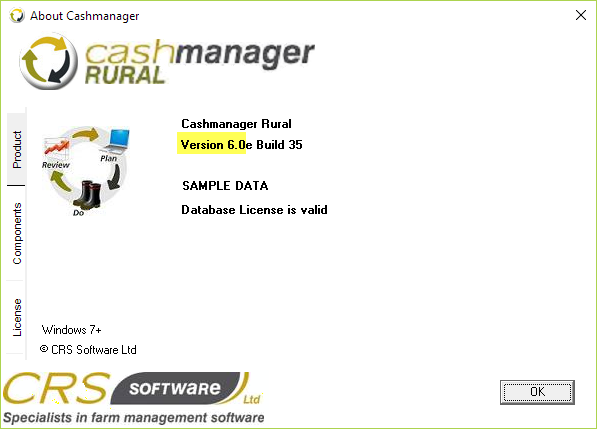 Download the latest version of Cashmanager RURAL desktop here. Click on the Help menu in any screen. The version will be displayed as highlighted below. The number of versions you download and install will depend on the version you're currently using. For example, if you're using version 6.0 you will need to individually download and install versions 6.4 and 6.8. Work through the list below in order of product version. IMPORTANT: Make sure you open your database in each product version before downloading and installing the next version. The team will complete the process for you, ensuring your database has been upgraded to the latest version of Cashmanager before emailing it back to you. In the meantime, download and install version 6.8 ready for your upgraded database. If the following warning appears while you're installing a product version, click on More Info and select Run anyway to continue installing Cashmanager. If you'd like to move to Cashmanager Online, have a chat with our Client Services team and start to enjoy the benefits of Online today.